Middlesbrough returned to second in the Championship as they held off a late Brentford fightback to win at Griffin Park. After a relatively quiet, goalless first half, Jordan Hugill tapped in to put the visitors in front. When Marcus Tavernier's downward header doubled the lead soon afterwards, the points looked safe, but Alan Judge fired in to pull one back for Brentford. A tense finale followed but Darren Randolph did well to save from the Bees' Josh Da Silva as Boro claimed back-to-back victories. The hosts, for whom defeat was their fifth in six games, had chances to level after Judge's effort, but Sergi Canos' low shot lacked the power to trouble Randolph. Then Boro, who are the only Championship side to have still conceded fewer than 10 league goals this term, should have added a late third only for Lewis Wing to place wide from close range. 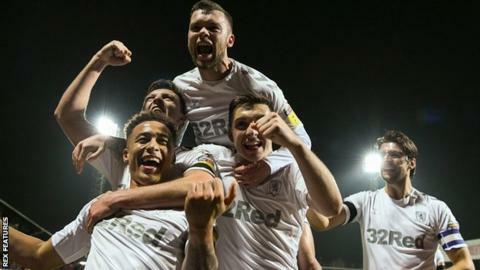 But Tony Pulis' men had already capitalised with two goals in five minutes during their best spell of the match, as first Hugill tucked in after Jonny Howson chested the ball down in the area and then Tavernier diverted home Dael Fry's fine right-wing cross. They remain unbeaten on their travels since a loss to now leaders Norwich on 15 September, while out-of-form Brentford have won just once in all competitions at home or away since the same date. "We dominated the game but you have to defend well in crucial situations, and although they were happy to sit back we needed to open the game up. "Middlesbrough are a big team and are favourites to go up, and we matched and were better than them for much of the game. But we also need to be more aware offensively with our final balls and decision making. "When we have Said Benrahma and Ollie Watkins fit we have enough quality to score goals, but in the meantime we need the rest of the boys to help out," he said. "They are working hard and showing big heart and if we keep showing that then I am not in any doubt that we will get out of this spell." "This is a very difficult place to come, it's a very tight ground and they move the ball around really well. They are a good side so this is a very good win. "I've been here a lot and it's not a ground you look forward to playing at under the lights, so it's pleasing that we came and did a very tight, professional job. "Once we were two up I thought we could have consolidated and looked to add to it, but we fell back a little and that allowed them to get back into the game which was disappointing. "But we were resilient, well organised and always posed a threat going forward, so I can't complain too much about the outcome." Match ends, Brentford 1, Middlesbrough 2. Second Half ends, Brentford 1, Middlesbrough 2. Chris Mepham (Brentford) is shown the yellow card. Foul by Chris Mepham (Brentford). Jordan Hugill (Middlesbrough) wins a free kick in the defensive half. Attempt missed. Josh Da Silva (Brentford) left footed shot from outside the box is high and wide to the left. Assisted by Rico Henry. Offside, Middlesbrough. Jonny Howson tries a through ball, but Jordan Hugill is caught offside. Substitution, Middlesbrough. Daniel Ayala replaces Marcus Tavernier. Attempt missed. Lewis Wing (Middlesbrough) right footed shot from the centre of the box misses to the right. Assisted by George Saville. Foul by Alan Judge (Brentford). Substitution, Middlesbrough. Lewis Wing replaces Stewart Downing. Substitution, Brentford. Rico Henry replaces Moses Odubajo. Corner, Brentford. Conceded by Adam Clayton. Corner, Brentford. Conceded by Darren Randolph. Attempt saved. Josh Da Silva (Brentford) left footed shot from outside the box is saved in the bottom right corner. Assisted by Nico Yennaris. Attempt missed. Alan Judge (Brentford) right footed shot from the right side of the box is high and wide to the right. Assisted by Sergi Canos with a cross. Substitution, Middlesbrough. George Saville replaces Muhamed Besic. Henrik Dalsgaard (Brentford) wins a free kick in the defensive half. Foul by Marcus Tavernier (Middlesbrough). Attempt saved. Sergi Canos (Brentford) right footed shot from outside the box is saved in the bottom right corner. Assisted by Neal Maupay. Goal! Brentford 1, Middlesbrough 2. Alan Judge (Brentford) right footed shot from the left side of the box to the bottom right corner. Assisted by Josh Da Silva following a corner. Corner, Brentford. Conceded by Aden Flint. Attempt blocked. Emiliano Marcondes (Brentford) right footed shot from the centre of the box is blocked. Assisted by Moses Odubajo. Substitution, Brentford. Josh Da Silva replaces Lewis MacLeod. Attempt saved. Sergi Canos (Brentford) right footed shot from the left side of the box is saved in the top left corner. Assisted by Chris Mepham. Attempt saved. Neal Maupay (Brentford) header from the centre of the box is saved in the top centre of the goal. Assisted by Emiliano Marcondes with a cross. Attempt blocked. Nico Yennaris (Brentford) right footed shot from outside the box is blocked. Assisted by Alan Judge. Attempt blocked. Lewis MacLeod (Brentford) right footed shot from outside the box is blocked. Assisted by Emiliano Marcondes. Attempt saved. Emiliano Marcondes (Brentford) right footed shot from outside the box is saved in the centre of the goal. Alan Judge (Brentford) wins a free kick in the attacking half. Foul by Adam Clayton (Middlesbrough). Substitution, Brentford. Emiliano Marcondes replaces Josh McEachran. Goal! Brentford 0, Middlesbrough 2. Marcus Tavernier (Middlesbrough) header from the centre of the box to the centre of the goal. Assisted by Dael Fry with a cross. Delay in match Nico Yennaris (Brentford) because of an injury. Attempt saved. Jordan Hugill (Middlesbrough) right footed shot from the centre of the box is saved in the bottom right corner. Assisted by Marcus Tavernier with a headed pass. Attempt missed. Neal Maupay (Brentford) right footed shot from the right side of the box is close, but misses to the right. Assisted by Lewis MacLeod following a corner.